The BankAmericard Credit Card currently has an Informr score of 8.8 out of 10. This score is based on our evaluation of 16 sources including reviews from users and the web's most trusted critics. 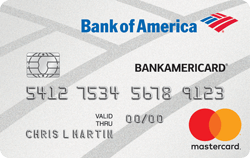 BankAmericard Credit Card is typically available to those with good credit scores (650 or greater). The BankAmericard Credit Card is a very straightforward offering. You won’t get any bells and whistles with this credit card. If you want help reducing your debt, and you want a long balance transfer intro period, this credit card can be a good choice. While this card does not offer any travel or cash back rewards, is it a great option for someone looking to consolidate balances and save money with a 0% APR introductory period. For the right person and the right situation, I absolutely love this card. No, it’s not meant to be an everyday card that will earn you massive amounts of points. It’s designed to be a balance transfer card or one you can make a large purchase with. That’s why they offer a great promotion rate to start instead of points or a cash signup bonus. This card charges the least in fees and interest if you pay off your debt within two years. Plus, you won’t lose your 15-billing-cycle 0% introductory period if you miss a payment. But if you need longer than two years, or just aren’t sure how much you can throw at your debt, you’re better off with the Ring. The versatility of the card's low intro APR offer makes this a compelling offer for cardholders wanting to pay off debt faster. A very good tool for avoiding interest on credit card debt, whether you’re planning a big purchase or need a way to reduce the cost of an existing balance. This card doesn’t offer many fun perks like rewards or cash back, so if that’s your thing, look elsewhere. But if you have a lot of high-interest debt and and excellent credit score, this might be the card for you. This card is best for people who have a balance they want to transfer and want to save the most money possible on fees and interest. If you’re looking to pay down debt, this card is a good choice. Unlike many other balance transfer cards that have a capped amount, you can transfer a balance of up to the credit limit you’re approved for.